NKJ Matthew 1:18-21 18 "Now the birth of Jesus Christ was as follows: After His mother Mary was betrothed to Joseph, before they came together, she was found with child of the Holy Spirit. 19 Then Joseph her husband, being a just man, and not wanting to make her a public example, was minded to put her away secretly. 20 But while he thought about these things, behold, an angel of the Lord appeared to him in a dream, saying, 'Joseph, son of David, do not be afraid to take to you Mary your wife, for that which is conceived in her is of the Holy Spirit. 21 And she will bring forth a Son, and you shall call His name JESUS, for He will save His people from their sins.'" 33% thought that one must be a Baptist who holds to Calvinism and Covenant Theology. 40% thought that one must be a Baptist who holds to the 1689 Confession. The sample from which this is taken is still pretty small at this point - with only 95 responses - but I remain hopeful that I may be able to get several hundred responses to the poll over the course of the poll's one year lifespan. There are 215 days left, so if you haven't responded yet, scroll down to the bottom of the page and weigh in. 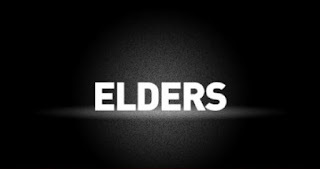 (3) Now concerning the apostles and prophets, deal with them as follows in accordance with the rule of the gospel. (4) Let every apostle who comes to you be welcomed as if he were the Lord. (5) But he is not to stay for more than one day, unless there is need, in which case he may stay another. But if he stays three days, he is a false prophet. (6) And when the apostle leaves, he is to take nothing except bread until he finds his next night's lodging. But if he asks for money, he is a false prophet. (12) But if anyone should say in the spirit, "Give me money," or anything else, do not listen to him. But if he tells you to give on behalf of others who are in need, let no one judge him. We don't have to wonder what these ancient followers of Christ would have to say about so many of today's televangelists, who constantly ask for money while trying to make it sound like the godly thing to do! What is the meaning of Ekklēsía? During the time of Jesus, the word ekklesia was used almost without exception to refer to a political assembly that was regularly convened for the purpose of making decisions. 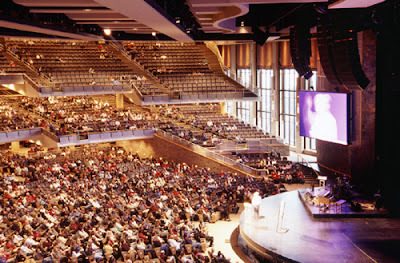 According to Thayer’s lexicon it was “an assembly of the people convened at the public place of council for the purpose of deliberation.” Bauer’s lexicon defines ekklesia as an “assembly of a regularly summoned political body.” In Colin Brown’s New International Dictionary of New Testament Theology, ekklesia is said to have been “clearly characterized as a political phenomenon, repeated according to certain rules and within a certain framework. It was the assembly of full citizens, functionally rooted in the constitution of the democracy, an assembly in which fundamental political and judicial decisions were taken . 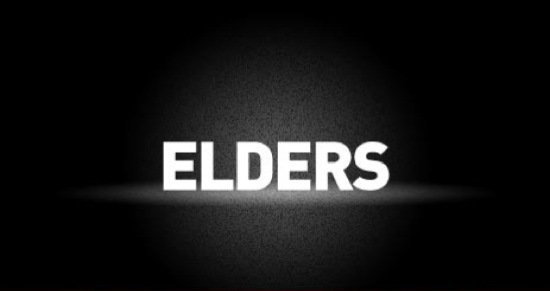 . . the word ekklesia, throughout the Greek and Hellenistic areas, always retained its reference to the assembly of the polis.” In the secular ekklesia, every male citizen had “the right to speak and to propose matters for discussion” (women were not allowed to speak at all in the secular Greek ekklesia). Even though I will essentially agree with his position about the importance of consensus in governing the local church, I strongly object to Atkerson's argument based upon the supposed meaning of ekklēsía in this respect. The problem that I have with this argument is that Atkerson restricts his understanding of the word to the secular use it had in the first century, while ignoring the Septuagint (LXX) background of the word, which is clearly the proper place to look for an understanding of Jesus' and the Apostles' use of the term. 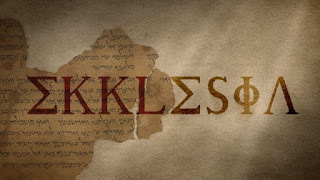 In fact, Atkerson asserts no less than four times that ekklēsía was a secular word and argues that this secular meaning was intended by Jesus when applied to the Church. He cites this meaning from two lexical works and one theological dictionary, and then he lists a single New Testament passage where this meaning is certain. But, just as he has done in his discussion of the meaning of dialégomai when arguing for interactive meanings (recall my response to his treatment of that term in a previous article), so here Atkerson has once again been selective and misleading in his use of lexical evidence. 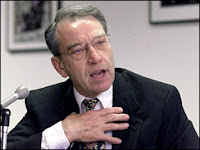 He operates under the faulty assumption that the word had no significant religious connotations in the first century and that, if Jesus wanted to use a word that carried religious rather than secular or political connotations, He would have chosen another word. But Atkerson couldn't be more wrong here, as even a casual reading of the very lexical sources that he cites will show. To be sure, the word ekklēsía did have a secular and political meaning in the first century, but all of the the primary lexical sources available also acknowledge a religious usage of the word and see this as the proper background of its usage in the New Testament. I will demonstrate the validity of this assertion by first examining the sources cited by Atkerson himself and then by citing several other recognized lexical authorities. I will quote in each case a significant portion of the cited works so that the proper context will be apparent. The reader will quickly see that Atkerson has simply avoided anything in these sources that happens to disagree with the meaning he wants ekklēsía to have in order to suit his argument. 1. among the Greeks from Thucydides (cf. Herodotus 3, 142) down, an assembly of the people convened at the public place of council for the purpose of deliberating: Acts 19:39. 2. in the Septuagint often equivalent to [qāhāl], the assembly of the Israelites, Judg. 21:8, 1 Chr. 29:1, etc., especially when gathered for sacred purposes, Deut. 31:30 (Deut. 32:1); Josh. 8:35 (Josh. 9:8), etc. ; in the N. T. thus in Acts 7:38; Heb 2:12. 3. any gathering or throng of men assembled by chance or tumultuously: Acts 19:32, 41. 4. in the Christian sense, a. an assembly of Christians gathered for worship... b. a company of Christians, or of those who, hoping for eternal Salvation through Jesus Christ, observe their own religious rites, hold their own religious meetings, and manage their own affairs according to regulations prescribed for the body for order's sake.... [Note: Both Matt. 16:18 and 18:17 are listed under this last heading. ](BibleWorks #1664). Notice that, although it doesn't make explicit the commonly assumed LXX background for ekklēsía, the Thayer lexicon does list the LXX usage (#2) as distinct from the secular usage (#1) and then goes on to list the word as having a Christian sense (#4) that is also distinguished from that of the common secular usage. And the primary meaning given there is not “an assembly of the people convened at the public place of council for the purpose of deliberation,” as Atkerson suggests, but rather “an assembly of Christians gathered for worship” (#4.a). It then goes on to give an additional meaning as “those who, hoping for eternal Salvation through Jesus Christ, observe their own religious rites, hold their own religious meetings, and manage their own affairs according to regulations prescribed for the body for order's sake” (#4.b) And, as I have indicated above, both uses by Jesus are included under this last heading and not as belonging to the secular meaning. How could Atkerson have missed this when he argued based on Thayer's work that Jesus intended the secular meaning? Now, I suppose that Atkerson may want to see connotations of the secular meaning in Thayer's mention of the ekklēsía's management of its affairs, but given that this meaning is listed as distinct from the secular meaning, it would make sense to look somewhere other than the secular background to determine the nature of such management. So, instead of trying to read the secular connotations into the word in order to help support a preconceived idea, one should just read the New Testament texts that address the matter of church government in order to assess its meaning, allowing Jesus and the Apostles to shape the meaning as they intended. At any rate, if the Thayer lexicon agreed with Atkerson, wouldn't it have addressed the meaning of the word under its secular usage (#1) as, perhaps, a subcategory? I conclude that it doesn't agree with Atkerson, and that he should have known this given even a cursory reading of the lexical definition. Notice that the first meaning, cited by Atkerson, is only one meaning that the word may have, but that it lists as a separate meaning the LXX usage of the word – a religious usage – with reference to the assembly of the people of Israel. And it lists the New Testament under the same category as that of the LXX, not as belonging with the secular usage. But you wouldn't know this if all you read was Atkerson's article. And you wouldn't know that the lexicon gives a reason for not seeing ekklēsía as being properly understood in accordance with the secular meaning. The entry plainly states that the term “apparently became popular among Christians in Greek-speaking areas for chiefly two reasons: to affirm continuity with Israel through use of a term found in Gk. translations of the Hebrew Scriptures [the LXX], and to allay any suspicion, esp[ecially] in political circles, that Christians were a disorderly group.” So, there is no doubt that the religious usage of the LXX is seen as the primary background for the meaning of the term, while at the same time it is acknowledged that it would have indicated an orderly assembly to those more familiar with its secular meaning. However, that the term had this added advantage doesn't entail that secular ideas predominated in the usage by the Church. The lexicon clearly dispels that notion. So, I assert once again that Atkerson is wrong about the meaning of ekklēsía as indicated in this lexicon and that he should have known this given even a cursory reading of the definition it gives. Atkerson just continues his practice of being selective and misleading in his use of such sources. Now, this passage does indicate that ekklēsía could sometimes be used to translate the Hebrew qāhāl in instances where it refers to a judicial or political assembly, but such an assembly among the ancient Jews would have been quite different from that of first century Greeks! Why, then, does Atkerson look to the first century Greek secular usage to support his view? The answer appears to be that this is really the only usage that could support his view. Such a usage just happens to differ with the very source he cites. Notice that NIDNTT believes that, if Jesus' usage of ekklēsía is congruent with the Jewish usage at the time (which the dictionary appears to grant), then it is indisputable that it is to be understood in light of its LXX usage as a translation for the Hebrew qāhāl (referring to the congregation/assembly of Israel). But this means that it sees the proper background of the term as being found in the religious usage of the LXX and not in the secular usage of first century Greek culture. This is opposed to Atkerson's view. But, again, you wouldn't know any of this if you only read what he has to say about the matter. So, after examining the three lexical sources cited by Atkerson in defense of his contention that Jesus intended ekklēsía to be understood as a secular term, it should be obvious to the impartial reader that even a casual reading of these very lexical sources demonstrates that he is wrong and that, in fact, these sources disagree with him. Note again that in each instance there is a separate listing or discussion of the word as it applies to the Church. None of these lexicons treat the usage of ekklēsía with reference to the Church as rightly belonging to a treatment of its secular meaning. The reason for this can be found especially in BAGD3 and Zodhiates as cited above. It is because the proper background for understanding the usage of ekklēsía as applied to the Church is not to be found in the secular usage of the first century but in the religious usage of the Septuagint (LXX). This Greek translation of the Old Testament Scriptures had been in common use among the Jews for generations by the first century and was the common Bible for the Apostles and early Christians as well. It provides the proper background for understanding much of the language in the New Testament as the above cited sources consistently – and correctly – assume. But what does all this mean with respect to Atkerson's argument about the nature and government of the New Testament churches? Well, it certainly means that he cannot use the first century Greek notions of a secular and political entity as the analogy he draws upon for so much of his understanding of the nature of governing in the New Testament churches. Rather it means that, if he wants to understand the correct form of governing in the churches, he should allow the various New Testament passages that actually have some bearing on the subject to speak for themselves, instead of trying to force a secular meaning into the text. This is a major flaw in his presentation and should give anyone pause when reading much else he has to say about the subject. I find it inconceivable that Atkerson could have written that “during the time of Jesus, the word ekklesia was used almost without exception to refer to a political assembly that was regularly convened for the purpose of making decisions.” That may have been true of pagan Greek culture at the time, but it definitely wasn't true of Jesus and the Apostles when referring to God's people. I also cannot imagine how Atkerson could say that “there were other Greek words Jesus could have used to describe His followers and their gatherings, words that carried religious and nonpolitical connotations.” Really? Then what are these words? What other words could Jesus have used if He intended to highlight the continuity of His people with that of the Old Testament assembly while at the same time distinguishing them as His own assembly? What other Greek word was there that was so connected in meaning with the Old Testament people of God and with the Hebrew qāhāl? If Atkerson is going to make such a claim, shouldn't he make some attempt to support it? I will conclude by saying that, as I see it, it is inexcusable that Atkerson simply ignores all of the evidence contrary to his view, even from the very lexical sources that he cites. After all, it is one thing for him to be mistaken on some point due to misunderstanding, or to have a stated disagreement with current lexicographical consensus, but it is another thing altogether for him to cite sources so as to give the impression that they agree with his view of Jesus' usage of ekklēsía when, in fact, these sources all disagree with him. Atkerson has led his readers astray here, and he should have known better. Nearly 30 percent of recent SBC seminary graduates now serving as church pastors identify themselves as Calvinists, according to data presented during the opening session of a conference on Reformed theology and the Southern Baptist Convention. 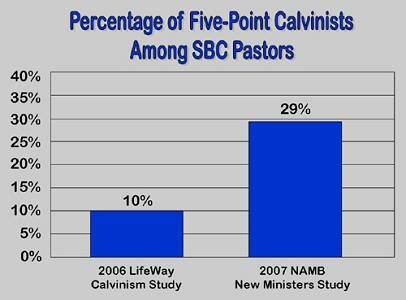 By contrast in the SBC at large, the number of pastors who affirm the five points of Calvinism is around 10 percent, Ed Stetzer, director of LifeWay Research, said in reporting various findings by LifeWay Research and the North American Mission Board Center for Missional Research. Such a rise bodes well for the Southern Baptist Convention, and one can only hope that this increase is also happening in other Baptist groups. And, of course, one hopes that the trend continues within the Evangelical community at large. Characteristics: Calvinistic convictions arrived at from within the broad mainstream Neo-evangelical ethos. Characteristics: Calvinistic conclusions arrived at out of the generally '3-4 point Calvinist' circles of 'Dallas' dispensationalism. Characteristics: Often connected with Presbyterians, possessing the same view of the Law's implication for Christian living, particularly in the form of Sabbatarianism, and 10 commandments as normative for Christians. Characteristics: Derived from the Reformed Baptist stream, but broke away from those circles over disagreement about Sabbatarianism and the relation of the Law to the Christian. Tended to emphasize a more Christocentric view of the Law (i.e. Law is fulfilled in Christ entirely, therefore the idea of Sunday as equivalent to a Jewish Sabbath is incorrect). Can draw from Progressive Dispensational circles as well as other eschatological perspectives. So, what do you all think? Do you think these are helpful or accurate categories? Do they reflect your own experience of the Reformed Baptist community? P.S. Thanks to Nathan White on the Reformed Baptist Discussion List for bringing this article to my attention. This picture reminded me of how we can all sometimes feel. We can all feel as though we are weighed down with a heavy burden, and, try as we might, we just can't seem to get anywhere. I have found at times like these I am generally feeling this way because I have begun to operate in the flesh, depending too much on my own strength rather than upon Christ. At such times I need to cry out to God in prayer, humbly recognizing that He alone is the source of all my strength and of anything good in me. And I try to remember a few key Scriptures that invariably see me through. I hope some of these scriptures will help to any of you who are feeling burdened and overwhelmed today! NKJ Matthew 11:28-30 "Come to Me, all you who labor and are heavy laden, and I will give you rest. Take My yoke upon you and learn from Me, for I am gentle and lowly in heart, and you will find rest for your souls. For My yoke is easy and My burden is light." NKJ Philippians 4:13 "I can do all things through Christ who strengthens me." NKJ 1 Peter 5:6-7 6 "Therefore humble yourselves under the mighty hand of God, that He may exalt you in due time, casting all your care upon Him, for He cares for you." What keeps us from coming to Christ with our burdens, so that we may carry them through His strength? Well, Peter assumes it can be nothing more - and nothing less - than pride. He assumes that truly casting our cares upon Him requires that we humble ourselves under His mighty hand. 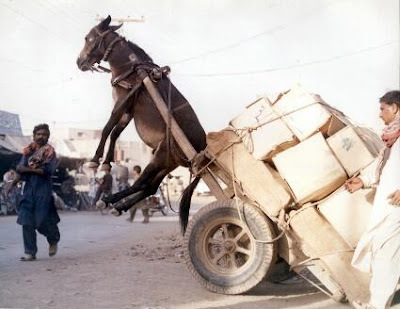 Could it be that we are more like a mule - although not the poor creature in the picture - than we want to admit sometimes? Too stubborn to really rely on God in everything? On October 3, 1789, in his first year in office, George Washington signed the first proclamation of thanksgiving by a U.S. President. If you click on the image at the left, you can read the original text as it was published in the The Massachusetts Centinel on Wednesday, October 14, 1789. WHEREAS it is the duty of all nations to acknowledge the providence of Almighty God, to obey His will, to be grateful for His benefits, and humbly to implore His protection and favour; and Whereas both Houfes of Congress have, by their joint committee, requefted me "to recommend to the people of the United States a DAY OF PUBLICK THANSGIVING and PRAYER, to be observed by acknowledging with grateful hearts the many and signal favors of Almighty God, especially by affording them an opportunity peaceably to eftablifh a form of government for their safety and happiness:" NOW THEREFORE, I do recommend and affign THURSDAY, the TWENTY-SIXTH DAY of NOVEMBER next, to be devoted by the people of thefe States to the fervice of that great and glorious Being who is the beneficent author of all the good that was, that is, or that will be; that we may then all unite in rendering unto Him our fincere and humble thanksfor His kind care and protection of the people of this country previous to their becoming a nation; for the fignal and manifold mercies and the favorable interpofitions of His providence in the courfe and conclufion of the late war; for the great degree of tranquility, union, and plenty which we have fince enjoyed;-- for the peaceable and rational manner in which we have been enable to eftablish Conftitutions of government for our fafety and happinefs, and particularly the national one now lately instituted;-- for the civil and religious liberty with which we are bleffed, and the means we have of acquiring and diffufing useful knowledge;-- and, in general, for all the great and various favours which He has been pleafed to confer upon us. Many of you have wondered where my website went over the past few weeks. Well, I was in the process of transferring to a new host provider and building an entirely new site - which is still in process - but I am happy to announce that the domain transfer finally went through and I am back up and running. I chose to go with Finalweb as my new provider, and their website building software, well developed church & ministry package, and fabulous support have made the change as pleasant as could be. In fact, I don't think I have found better support anywhere. They even offered free support while I was taking it for a test drive with their free 14 day trial. For example, during the trial time I found that there was a problem with downloading topic notes files for e-Sword that I had uploaded to the server. Their software apparently didn't like the '.top' extension. Well, I called the technical support team and they had the problem fixed before the trial time was even concluded! I think it was just a few days later that I tried it, and it worked. On that note, for all you e-Sword users that liked to download the many Reformed resources I previously made available on my website, I assure you they will all be back soon. I am in the process of uploading them all (and more) as soon as possible. Anyway, I cannot recommend Finalweb highly enough. And, for any other Shepherds' Fellowship members, you can receive a significant discount. 19% thought that one only had to be a Baptist who held to Calvinistic soteriology. 39% thought that one must be a Baptist who holds to the 1689 Confession. The sample from which this is taken is still pretty small at this point, but I remain hopeful that I may be able to get several hundred responses to the poll over the course of the poll's one year lifespan. There are 245 days left, so if you haven't responded yet, scroll down to the bottom of the page and weigh in. P.S. Some of you may have noticed that the percentages Blogger lists don't always add up to 100. This appears to be due to Blogger's rounding the numbers up or down. But the tallies still give us a pretty good idea where things are. At the end of the year, I will figure the percentages more accurately. I was registered the first time around and was so pleased not to be getting all those sales calls. I jumped at the chance to register again, and I would encourage the blog's readers to do so as well... unless you like to be interrupted by telemarketing calls all the time! Just thought you all might want to get in on a good thing. As announced at the Said at Southern blog, "the 2008 Band of Bloggers fellowship will take place during lunch (11:30-1:30) on Tuesday, April 14, 2008 at the Galt House in downtown Louisville, Kentucky. Guest speakers and panelists for the event include Tim Challies, Justin Taylor, Thabiti Anyabwile, and Mark Lauterbach .... The theme for next year’s conference, 'The Gospel Trust,' will focus on what it means to be servants of God and stewards entrusted with the gospel of Jesus Christ." For the Gospel of Jesus Christ. The Band of Bloggers was started with a vision and collaborative effort to unite bloggers who have a passion for the gospel of Jesus Christ. It carries with it a desire that the gospel be normative in our lives, central in our writing, and powerful in our witness to the world. 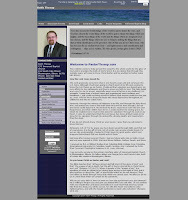 The first Band of Bloggers fellowship developed when several bloggers who were attending the 2006 Together for the Gospel Conference discussed the possibility of holding a meeting to encourage one another to live and write with a gospel-centered emphasis. Within a matter of weeks, the idea had blossomed to an event with a panel of speakers–Justin Taylor, Tim Challies, Dr. Albert Mohler, and Dr. Russell Moore–and a gathering of more than 70 bloggers hosted by The Southern Baptist Theological Seminary. The meeting served to compliment the thrust of the conference, viz. to come together for the sake of the gospel in this generation. The second Band of Bloggers fellowship is slated to take place in 2008, again in concert with the Together for the Gospel Conference. This year’s theme, “The Gospel Trust,” focuses on what it means to be entrusted as servants of God and stewards of His glorious gospel. During the period of time leading up to the 2008 Band of Bloggers fellowship, we will endeavor to fuel a greater passion for the gospel of the glory of Christ through resources, articles, and media (including podcasts). As we seek to facilitate discussion and foster gospel-driven lives and blogs, we encourage you to join in and share this vision with others. For comments, questions, or to contact us, please email to thegospeltrust@gmail.com. Lord willing, I will be in attendance this year. Perhaps I will meet some of you there? As someone who is new to the blogging experience, I hope to gain much from my more experienced fellow-bloggers about how to more faithfully serve Christ and the Gospel through my blogging efforts. 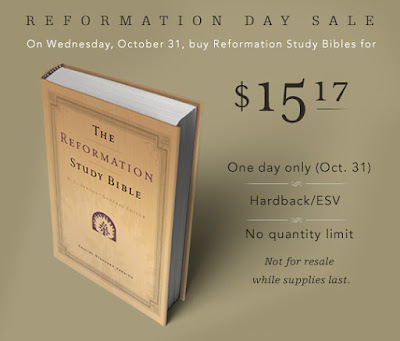 Ligonier Ministries is offering a great study Bible for an unbelievable price on their one day only Reformation Day Sale on October 31. I began using the New Geneva Study Bible back when it first came out in about 1995. The name was changed a few years later to the Reformation Study Bible. It was originally offered with the New King James Version translation, but they later changed to the English Standard Version when it became available. Widely considered one of the best tools available for Bible study and previously only available in the New King James translation, The Reformation Study Bible has been updated to the readable and accurate English Standard Version (ESV). This foundational resource was created by more than fifty scholars and features thousands of in-depth study notes, 96 theological articles, 19 in-text maps, and 12 charts to help you understand the Bible better. The Bible measures 9 ¼ in. x 6 ¾ in. The type of the ESV text is 10.25 points and the study notes are approximately 8 points. This is the study Bible for the next generation of reformers. P.S. Sorry for posting this so late. But at least you still have two days notice. This is the question posed in the title of an October 18 article at the Out of Ur blog at the Christianity Today website. The subtitle reads, "Why the most influential church in America now says 'We made a mistake.'" Imagine that. Actually teaching people how to read the Bible for themselves. How could this possibly seem like a novel idea for any church? The much debated James Ossuary, with an inscription reading ""James, son of Joseph, brother of Jesus," has still not been conclusively ruled a fake. Although no one doubts that it dates to the time of James and Jesus, there has been some question whether or not the inscription was a forgery. However, after having been ruled a fake early on by the Israel Antiquities Authority (IAA), many experts afterward questioned this finding and believed it to be authentic. A couple of articles at the Biblical Archaeology Society website question the earlier findings. (a) The ossuary had been examined by scientists of the Geological Survey of Israel and also by expert curators at the Royal Ontario Museum in Toronto; neither of these teams concluded that the ossuary or its inscription was fake. In fact, the scientists of GSI went out of their way to stress that “the patina does not contain any modern elements (such as modern pigments) and it adheres firmly to the surface. No signs of the use of a modern tool or instrument was [sic] found.” (b) The reaction of the IAA is simply the same as the attitude of most archaeologists about artifacts obtained from antiquities-dealers, as already mentioned. Only now, it has become a matter of politicized archaeology, advocated by the highest authority on antiquities in the State of Israel. 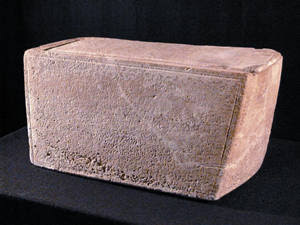 The studies we [at the Royal Ontario Museum] conducted have convinced us that the ossuary and its inscription are genuinely ancient and not a modern forgery. This conclusion, of course, is consistent with the findings of leading Semitic paleographers and Aramaic linguists, as well as the Geological Survey of Israel, and contradicts those who assert that the inscription must be a forgery simply because it is "too good to be true" or because it surfaced on the antiquities market rather than having been found in a professional archaeological excavation. 17% thought that one only had to be a Baptist who held to Calvinistic soteriology. 32% thought that one must be a Baptist who holds to Calvinism and Covenant Theology. 42% thought that one must be a Baptist who holds to the 1689 Confession. The sample from which this is taken is still pretty small at this point, but I remain hopeful that there will be many other respondents to the poll over the coming year. There are 276 days left, so if you haven't responded yet, scroll down to the bottom of the page and weigh in. The Gospel is not something that we outgrow our need for as we move on to the "deeper" issues of the faith. In fact, I would say that growth in the Christian faith means spending the rest of our lives understanding just what the Gospel really means for us. Besides, we certainly need to remember our need for God's grace through Jesus Christ every single day! And this means that we need the Gospel every day. Anyway, I was very encouraged to find this video of John Piper at GodTube called "6 Minute Gospel," in which he says essentially the same thing... only better than I could say it! I just wish even more pastors would get ahold of this basic idea because, if our people really do need the Gospel every day, then we need to make sure we keep telling them that. I do not know if I am disgusted or just curious. Yet, in th election race, beliefnet.com has a "God-o-Meter" to rank the Presidential Candidates on their religous [sic] talk. I am not necessary [sic] endorsing the meter and believe it to only be using "God talk" as a litmus and not true solid theology in those talks. Therefore, someone like Obama could talk a lot about God but the theology is purely Post-Modern and he gets the same ranking than [sic] Mike Huckabee who has better theology. Derick has hit the nail right on the head here. There are some accompanying articles that help to clarify the specific views of a few of the candidates, but the only way one can get a true sense of where each one comes down on crucial issues (such as abortion and gay marriage) is to visit each person's site and wade through all the double-speak (with a few exceptions). It looks to me as though the God-o-Meter may actually be an attempt to blur the distinctions between men such as Huckabee and Obama in order to dupe less knowledgeable or less discerning Evangelicals into thinking that they are relatively equal choices. One wonders if a political liberal didn't come up with this thing just for this purpose. Do I sound too cynical? Well, remember that Time magazine isn't exactly a bastion of conservatism. Anyway, thanks Derick for pointing it out.